… it seems at first glance that they look to be more or less the same thing i.e. how different is it to reuse a plastic bottle to contain some liquid from recyling it? particularly if the manufacturer had intended for it to be a disposable container? Yet, from the big picture perspective, one can say (and it has been said before) the whole concept of recycling is a cost in the OECD world whereas its actually a source of income, in a myriad ways, among the BoP. That is, the lower income market tends towards maintenance and extending the lifespan of the products (through repair or repurposing it) they purchase rather than disposing it for convenience or replacing it for a trendier style. c) not be profitable enough, given the comparative cost of labour vs the price of the product involved. These conditions for making money, and more so, making money that is deemed a valid ROI seem only to be available among the lower income demographic and in the developing world. 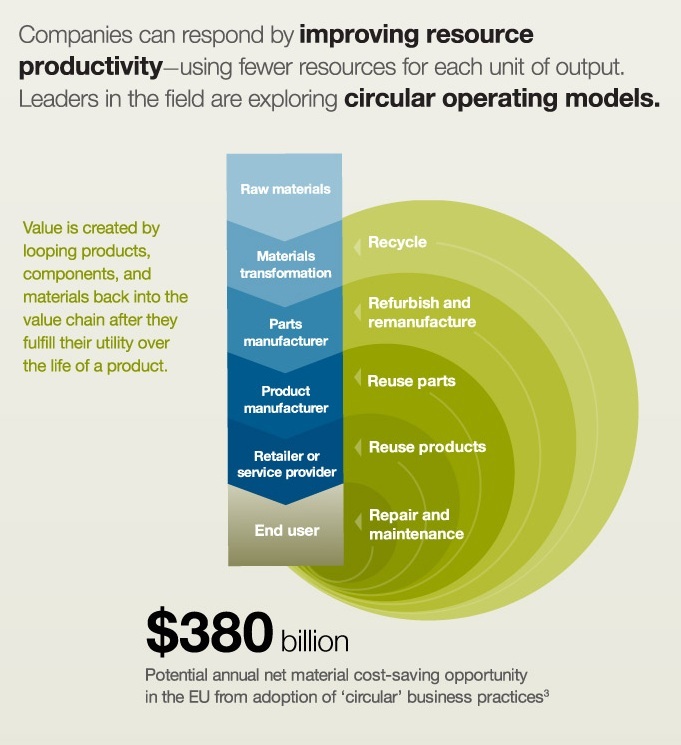 Value is created by looping products, components, and material back in to the value chain after they fulfill their utility over the life of the product. Yes, indeed, the leaders in the field are exploring these hitherto unconsidered sources of inspiration for process innovation. It was this basic insight that led us to the research project among the jua kali of Kenya in August of 2010. Innovation under condition of scarcity capture our initial findings from the fieldtrip to observe, document and be inspired by the informal manufacturing ecosystem in the resource scarce parts of the developing world. My research associate Mikko Koskinen and I prepared this set of slides showcasing this informal industrial ecosystem whose practices, we believed, could conceivably inspire new ways of manufacturing and material use for a more sustainable future. You’ll note in the second last slide the table of research outcomes as they related to business, design and of course, engineering. After all, we were part of the Design Factory, an interdisciplinary experimental platform for innovation. You’ll find mention of REculture as a concept for sustainability and value creation here and here, based on my original work in Finland. This article offers a practical set of tools to help manufacturers and waste-management companies capture the resource-productivity prize. Manufacturers are likely to achieve the quickest impact if they start by focusing on their areas of core competency. But to secure the full value of their efforts, companies must optimize their operations for resource productivity in four broad areas that cut across their business and industry: production, product design, value recovery, and supply-circle management. By taking a comprehensive approach to resource productivity, companies can improve their economics while strengthening their value propositions to customers and benefiting society as a whole.